A kapurala shaman-priest (at right, shrouded under canvas) embodies the unseen god as he bears the tiny casket believed to contain the yantra, or rather the God himself, and prepares to mount Swami upon the tusker's back. 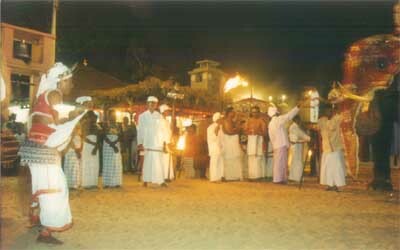 Nightly during the fortnight-long Esala festival, white-clad kapurala shaman-priests perform a complex, carefully choreographed ritual in which the Kataragama god stealthfully emerges from his Mahadevale residence, rides in grand torchlit procession upon a caprisoned elephant to visit his sweetheart, the jungle princess Valli, and returns without being seen despite thousands of devotees straining to see him. The Kataragama God, mounted on a tusker at right, begins His nightly procession at Kataragama. His simple, unimposing Mahadevale residence can be seen in the background. 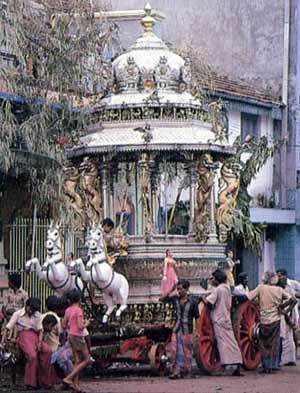 Among the Hindu festivals of Ceylon the Kataragama festival is looked upon with great veneration. The annual festival commences on the new moon of Ādi (July-August) and lasts a fortnight. Hindus, Buddhists, Muslims and Veddas gather there in thousands either to fulfil their vows or to seek knowledge and guidance from Lord of Kataragama. The festival highlight is the perahera or procession takes place at night from 7 p. m. to 10 pm. Long before the appointed hour the premises are full with devotees carrying on their heads earthen vessels containing holy ash and burning camphor. Besides, there are the thundering of drums and the playing of flutes. At the same time the shouts of " Haro Hara" drown the chorus of " bhajana " parties. In this din and commotion, the Basanayake Nilame and and kapuralas with other temple officials take the casket of the god in procession on the back of an elephant with chamera, damps and flambeaux. First the procession proceeds at a slow space round the three temples within the walls, then it proceeds to Valli Amma temple. Thereafter, the procession goes by Meda Vithiya and back to the main temple. On the last day on the morning following the full moon the Water-Cutting Ceremony is enacted. 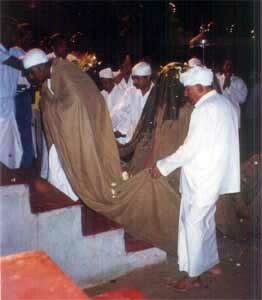 The holy casket is taken in the usual manner to the Manika Ganga.  Here placed in a palanquin and covered with a cloth it is dipped in the sacred waters. Then amidst the shouts of "Haro Hara" and the beating of drums thousands of pilgrims with upraised hands bathe in the consecrated waters of the river. Another popular attraction of the festival is the exciting fire-walking ceremony. This is usually done a few days before the end of the festival in front of the main temple at night. Before the appointed hour a large area is covered with a few cart loads of firewood and set ablaze. The red hot cinders keep on glowing in a trench along a course some twenty feet long. At about 4 am the performers, after finishing their religious ablutions in the waters of the sacred river, walk with wet garments towards the temple for worship. Having had the divine blessings, they stand with joined palms before the fire, making a last entreaty for additional strength of mind. The spectators become intensely excited. Then with the shouts of " Haro Hara" they walk/run bare-footed over the red-hot cinders, some not once but many times without even the faintest trace of a burn. Some years ago a padre to belittle the performance attempted to do the same but got himself severely burnt. It is best to state in this connection that victories are won not only by science, but also by faith. Kandy has its perahera and Colombo has its Vel Festival. The latter is held in honour of Lord Murukan popularly known among the Sinhalese as Kataragama Deviyo. A day or two before the water-cutting festival of Kataragama, a gaily decorated silver plated chariot drawn by a pair of snow-white bulls carrying the statue of Lord Murukan leaves the Pettah Kathiresan temple to the shrine at Bambalapitiya. This is the beginning of the Vel Festival which is held every year to commemorate the victory of Śrī Murukan over the forces of evil. The procession proceeds along the accustomed route with multi-coloured umbrellas, caparisoned elephants, dancers and oriental musicians through a mass of worshippers and sightseers. It moves slowly while the drums throb, the bells tinkle and the Tanjore band plays till it reaches its destination. A bhajana party singing divine songs follows the chariot. After a journey of six miles the pageant enters the temple where thousands of devotees flock to pay their homage to Lord Murakan by breaking coconuts, lighting joss sticks and burning camphor. The temple with its pageantry and panorama of twinkling illuminations attracts the religious and non-believer alike. In the temple precincts and along both sides of the Galle Road traders of all races sell their merchandise  foodstuffs, clothes, brass utensils, camphor, beads, bangles, toys, earthen ware, sweetmeats, pictures, etc. The sugarcane juice dealers also do a brisk business. When the illuminated Vel car returns on the evening of the third or fourth day along the accustomed route the crowd swells to immeasurable proportions. The Galle Road for many miles is a sea of heads, and when the Vel car arrives at Galle Face Green, the pageant becomes grand and imposing. First-class fireworks specially made for the occasion continue to illuminate the night sky with their multi coloured lights. There is much fun and excitement. Bullock carts of all sizes and shapes line the roads, for the occupants have come from distant villages to see their war-god taking a drive through the city. The roads become impassable for vehicles, but everybody is happy and smiling. With the deafening shouts of 'Haro Hara', the Vel car moves slowly to its destination. Today the Vel Festival has become a national festival of the island. The new moon in the month of Ādi is also the last day of the festival at Mavittapuram Kandaswamy Temple. In the early hours before sunrise an insignia of the presiding deity is taken in procession with the beating of drums and the playing of music to the shores of Keerimalai for the water-cutting ceremony. Throughout the night preceding the festival and the new moon day streams of pilgrims come pouring in front all parts of the Jaffna peninsula to this holy centre to partake in the ceremonial ablutions and to make religious offerings to their dead. Year after year for hundreds of years the pilgrims have marched in this manner to Keerimalai. It is fascinating to think how the tradition is preserved by the power of faith. Among this great concourse of people we can see the family priests who have assembled here from distant places occupying advantageous positions on the sandy beach to help the pilgrims in their offerings and salutations. When at an auspicious hour the image of the deity is given a dip in the consecrated waters, thousands of men and women uttering mystic mantras immerse themselves in the rolling waters. There is an intense religious atmosphere pervading this holy place. For the time being these pious pilgrims become saintly characters. There is no privacy for the bathers in the beach. For here man looks upon woman as mother or a sister, nay, as the Divine Mother Herself. The vast crowd of pilgrims disperses soon after attending the pujas to the gods. In the evening the festival ends and Keerimalai resumes its calm for another year.